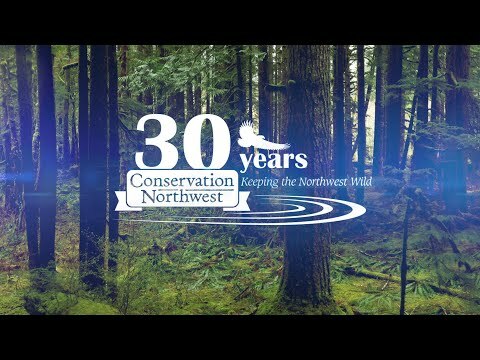 After decades spent protecting, connecting and restoring lands in the Cascades Mountains and Kettle River Mountain Range, in 2014 we began a new collaborative effort focused on the vital connection between these two landscapes where it crosses through the Okanogan Valley. Funded by the National Fish and Wildlife Foundation (NFWF) and coordinated by Conservation Northwest, the Working for Wildlife Initiative is a coalition of state, federal, tribal and nongovernmental interests working together to protect wildlife habitat, working lands and natural heritage in the diverse landscape of the Okanogan Valley and Kettle River Mountain Range. To date we have built strong partner capacity, invested in habitat restoration on public and private lands, secured key parcels under conservation easements, documented lynx presence in the Kettle Range, and initiated recovery planning for lynx. Learn about the Working for Wildlife Initiative partners, including NFWF, Okanogan Land Trust, Okanogan Conservation District, Mule Deer Foundation, Confederated Tribes of the Colville Reservation, USFWS, USFS and BNSF Railway. This new initiative is only possible because of generous donor and grantee support. Thanks to the Washington Women’s Foundation, The Orvis Company, New Belgium Brewing, and our other partners for making it possible! The Okanogan Valley has long been an important home and migration pathway for both people and wildlife in north-central Washington. Bordered to the north by Canada (where the valley continues and a new grasslands national park is in the works), to the west by the North Cascade Mountains, to the east by the Okanogan Highlands and beyond that, the Kettle River Mountain Range and Columbia Highlands. This broad open valley of sagebrush grassland and Ponderosa pine forest is known for its special qualities: sparkling rivers and lakes, rocky outcrops and highlands rising above the valley floor, productive agricultural lands, and a wide diversity of wildlife and habitat. Generations have cherished the land and sustained themselves on what it offered. Semi-nomadic First Peoples maintained camps in the valley through the winter, following the seasons, moving from place to place to hunt, fish and harvest food and cultural plants. The descendants of these aboriginal residents remain and continue their traditional and treaty-protected uses of the landscape. Wildlife in the region remains abundant. Okanogan County is home to the largest mule deer herd in Washington state, and these ungulates migrate seasonally between winter and summer ranges. An average of 350 deer are killed in the valley each year by vehicle collisions along a 11.7 mile stretch of Highway 97 between Tonasket and Riverside, with an average societal cost of over $7,000 per collision. This is just one example of the need for greater habitat connectivity and safe wildlife passage in the area. One of the largest remaining Canada lynx populations in the continental United States is anchored in the high country of the western Okanogan around the Pasayten Wilderness and Loomis Forest. Though much of their habitat is now protected, these big cats are isolated, and better connections to additional habitat in the Kettle Range are critical for their survival. One of the state’s only populations of sharp-tailed grouse lives within the sage-steppe lands of the Tunk Valley and surrounding areas in the central Okanogan. Recent wildfires have limited their habitat, breeding areas, and cut into their population, placing these amazing birds in urgent need of conservation support. Mule deer, lynx and sharp-tailed grouse make-up the three priority species for the Working for Wildlife Initiative, but a wide range of other iconic animals call this region home. Wolves roam forests on both sides of the valley, with a few grizzly bears residing in the surrounding high country. White-tailed deer are also present, and elk in lesser numbers. Bighorn sheep herds call the rocky ridges around the north end of the valley home, while Shiras moose reside among wetlands and meadows at the foot of the surrounding mountain ranges. Cougars, bobcats, black bears and coyotes are relatively common. Many smaller animals, birds and fish also depend on this diverse landscape. This wildlife diversity exists alongside the county’s rural agricultural character. Orchards, farms, ranches and sawmills are at the heart of the Okanogan economy and culture. Rivers and other natural obstacles to wildlife movement have always existed, but the additional effects of human development are raising concerns that must be addressed for long-term coexistence. The spread of invasive plant species and a legacy of fire suppression have also caused forest health problems that directly impact habitat function. Continuing expansion of development into rural areas is fragmenting habitat, reducing agricultural production and diminishing the rural lifestyle of the Okanogan Valley. The resulting increase in traffic along Highway 97 has increased the risk to public safety from vehicle collisions with wildlife while making it more difficult for wildlife to safely move. Learn about Safe Passage 97, a collaborative effort led by a local Mule Deer Foundation chapter under the Working for Wildlife Initiative to reduce animal-vehicle collisions. By 2020 we aim to conserve existing habitat values on tens of thousands of acres of private land, construct three wildlife underpasses on Highway 97 to facilitate safer passage, restore habitat quality and resiliency on 20,000 acres, augment the local population of sharp-tailed grouse, lay the groundwork for recovery of Canada lynx in the Kettle River Mountain Range, and establish programs and relationships to increase the community’s tools and pride in coexisting with wildlife so this work will continue over time. All of these strategies are supported by a science-based decision support tool and rigorous monitoring and communication plans to ensure that our actions are strategic and advance us toward our goal to measurably maintain and improve the ability for wildlife to move across this landscape.